During my January tidy of my sewing room, I rediscovered a bag of blue fabrics that I had pulled out of my stash and set aside to make a quilt. I had long ago chosen the pattern I wanted to make: a hunter’s star. I just needed to start sewing! I did not have quite enough variety, so I bought four more 30-centimetre cuts from a local fabric shop when it was closing down. 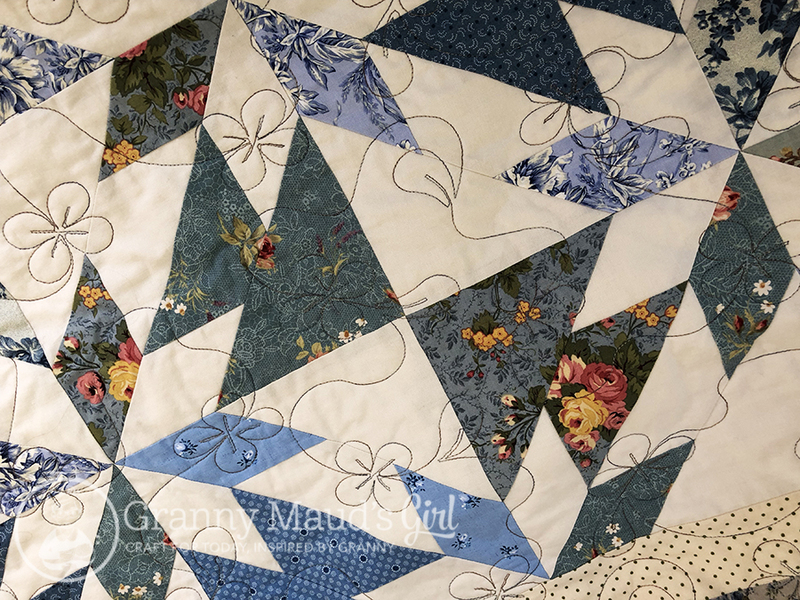 Everything else in the quilt top – the cream background fabric, the two borders and most of the blue fabrics – came from my stash. Now it is finished, I have very little in the way of scraps left, so this has been a good stash-busting project. After a bit of Internet research/time-wasting, I decided to follow the Happy Homemaker’s hunter’s star tutorial. It does not need any special rulers, and it comes together like a charm. The seams all nest together beautifully, and the points match as they should. The only thing I did differently was square my blocks to 8⅝ inches instead of 8½ inches, because I could. Why cut off more than I needed to? My seam allowances must be pretty scant. You cannot go wrong with a classic design. I made it as big as I could with the fabric I had, and it ended up at 70 × 78 inches, or 178 × 198 centimetres. It might shrink a bit after its first wash. I would happily make this pattern again, perhaps in a fun scrappy combination. Although it has taken me six months to finish this quilt (I started cutting in March), it is really a quick and easy pattern. I knew I wanted to use up the leftover floral print for the border, but adding the inside border was a late idea when I found the spotted fabric in my stash. I mitred the borders for neat finish. I mitred the corners of the borders for a neat finish. 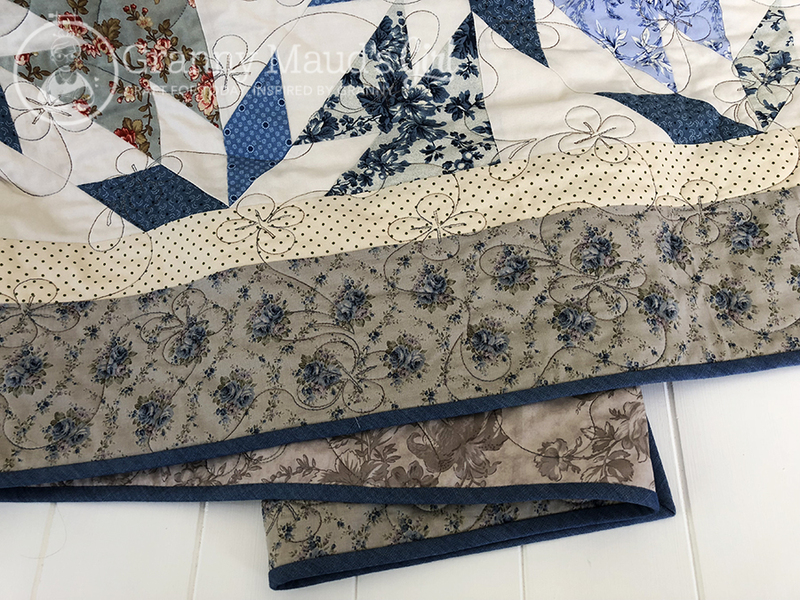 The floral border fabric and many of the other fabrics date from when I took my first quilting classes at Primarily Patchwork in Melbourne, about 15 years ago. They are from a period in my life before I had anything that could be called a fabric stash! Some of these fabrics – such as the ones with the yellow flowers and the lace design in the background – date from my earliest quilts. The quilt top was finished in May, in the same week that I broke my toe and could not drive. My cousin came to the rescue and drove me to the nearest quilt shop, Southlands Sewing and Fabric Centre, to choose binding (chambray) and backing. I was going to drop everything off at my usual long-arm quilter, but because I could not drive, I accepted the shop’s offer to use their quilting service, Kwerki Quilting. 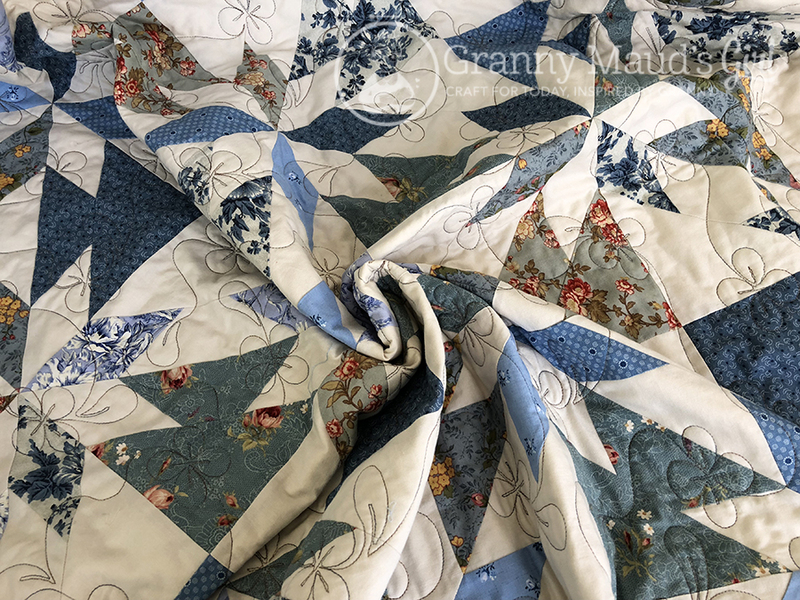 Because my cousin and her baby were patiently waiting for me, I left choosing the quilting pattern and thread in their capable hands instead of spending hours in indecision, and I am happy with what they chose: a variegated blue and taupe thread, and a pretty, curving floral design. I bought a grey-taupe wideback fabric by 3 Sisters for the backing. It took me a while to sew the binding down and even longer to take some photographs of the quilt, but it is finished now. The blue and cream combination looks fabulous in our spare bedroom, but my plan is to donate the quilt to my grandmother’s nursing home. The blue matches the residents’ sheets, but I think they might choose to raffle it at Christmas. I would also be happy if they gave it to someone on the staff as a prize or tucked it around a chilly resident. They take such fabulous care of my granny, who is now in the high-care dementia area; it is my way of saying thank you. The swirly quilt trick is much harder than it looks. 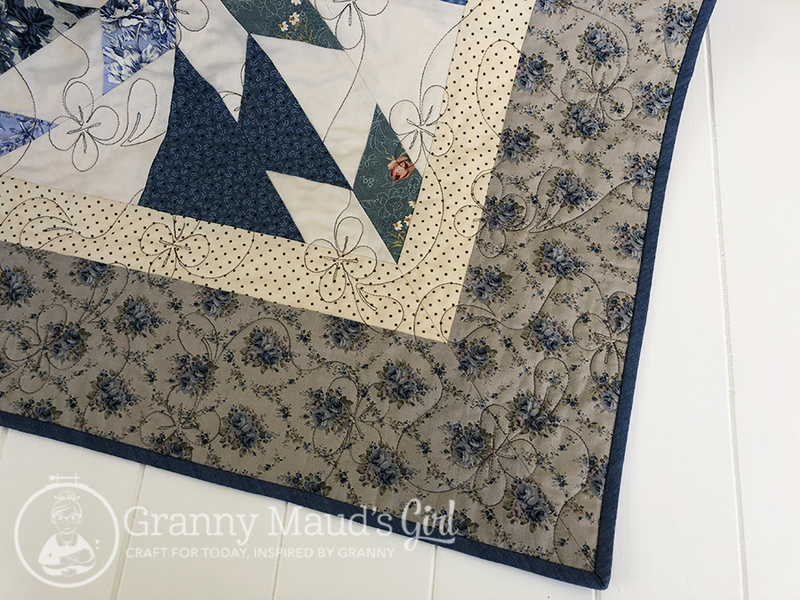 This quilt is lovely, and not only because blue and white scrap is my favourite combination. The quilting is just right, being not too dense, so the quilt stays soft and cuddly. Well done. 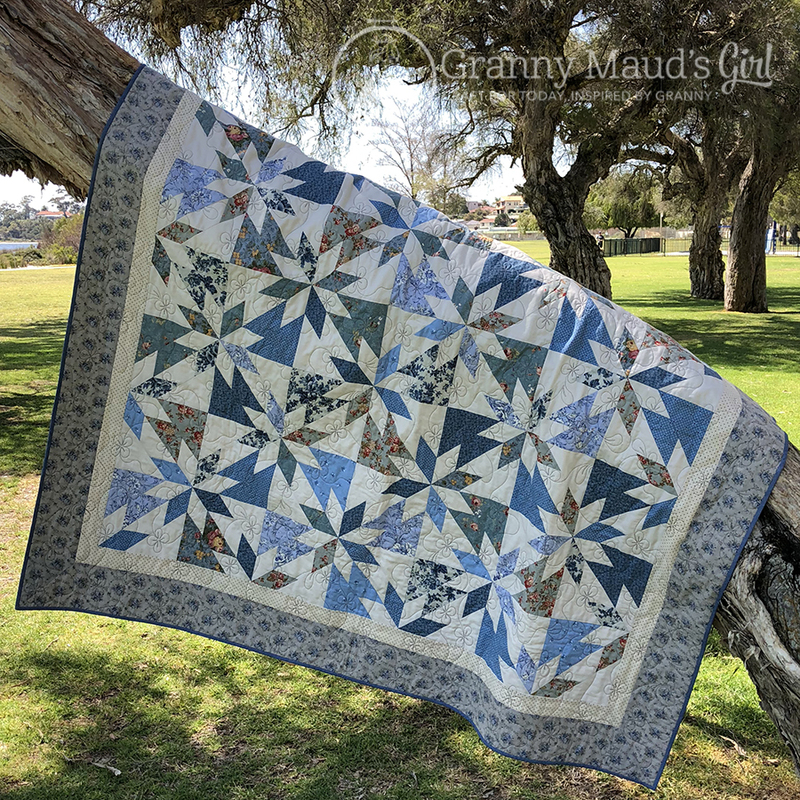 It’s gorgeous, even if your fabric tastes have moved on since you first planned the quilt. 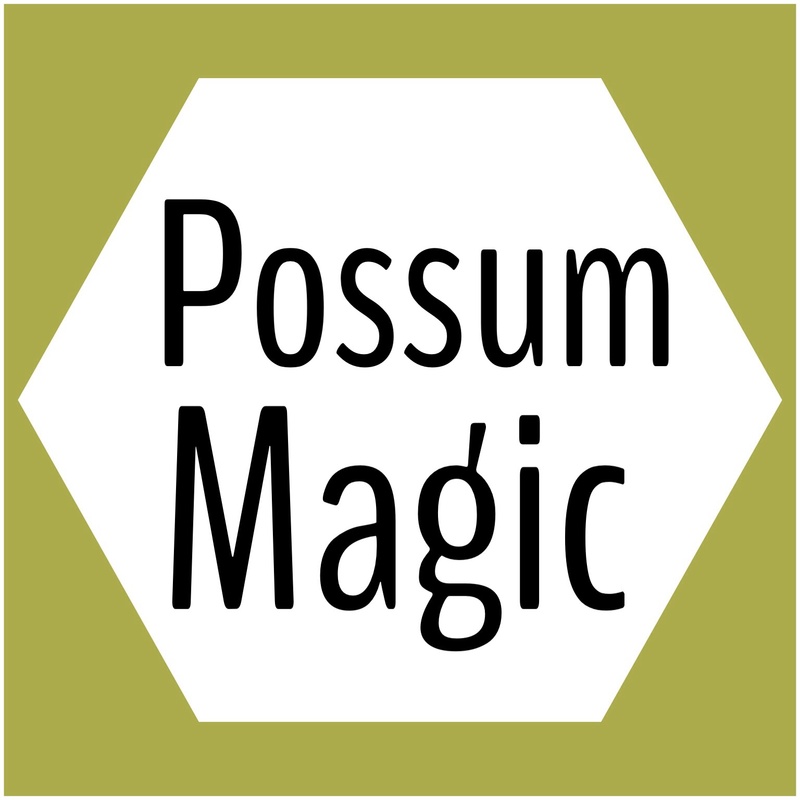 It has a pretty vintage vibe without being fuddy-duddy. I love your plan for its future, too! Lovely quilt Carla! A classic design which is always pleasing to the eye! And who doesn’t love a blue and white quilt. How lovely that you are donating it too! Did I ever know that you went to classes at Primarily Patchwork? It was my favourite place to visit when I was expanding my quilting skills! It’s beautiful! 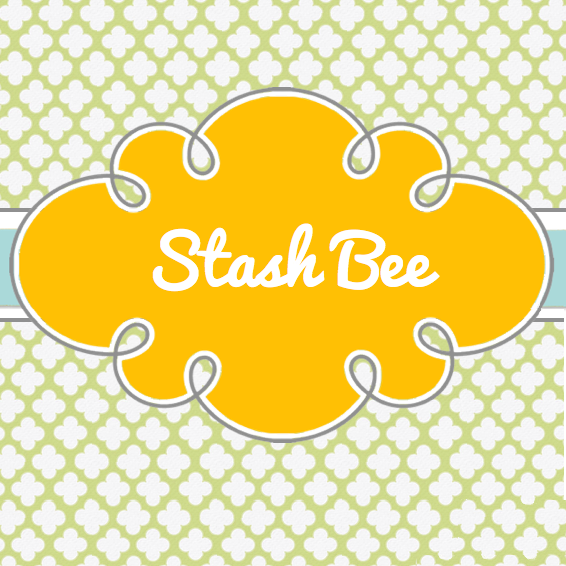 And a lot from stash, wow! I have fabric and patterns all set for quilts for someday… retirement? Maybe I should not wait? This quilt is beautiful. Love the fabric combinations. Great job! 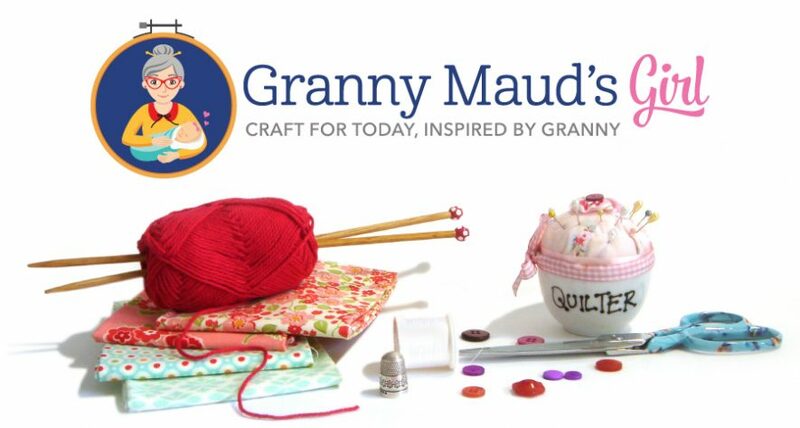 Not only is your quilt beatiful, so are your gifting intentions! A beautiful quilt! I too am a blue & white fan, always have been. I’m sure it will be well loved. It’s beautifully pieced as always! A friend of mine has all the supplies for a Hunter’s Star quilt. I’m going to showing her your version. That should get her motivated to make a start. Very pretty indeed. The blues are amazing. What a beautiful quilt; I’m glad you have been making in the moments you can. I’m sorry to hear about your granny needing the high-care area and I am sure the quilt will be used and loved. THis is such a gorgeous finish! Congratulations on a wonderful quilt to curl up in.